Combine pineapple juice, soy sauce, lime juice, ginger, garlic, and chile in medium saucepan. Add tempeh, bring to a boil, reduce heat, cover, and simmer 20 minutes. Remove pan from heat, uncover, and allow to cool to room temperature in liquid. Light grill or preheat broiler. Place mushrooms, tomatoes, and shallots in bowl. Combine oil and basil in a small bowl and drizzle over vegetables. Toss gently to coat. Season lightly with salt to taste. 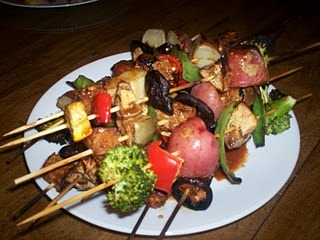 Drain tempeh and thread on eight skewers along with vegetables. Grill or broil, turning once, until tempeh and vegetables are marked with dark stripes, about 10 minutes. Serve and enjoy.